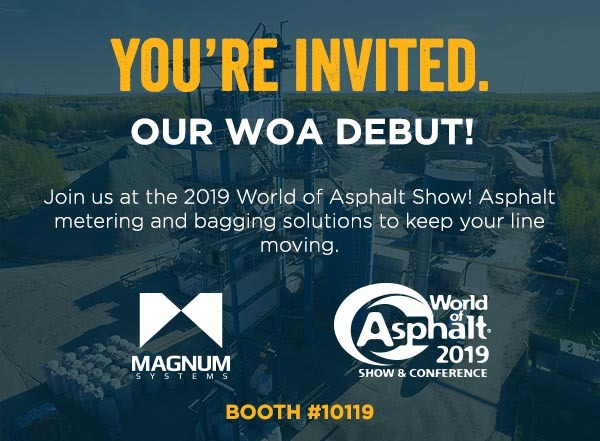 Magnum Systems is set to exhibit next month at the World of Asphalt Show in Indianapolis, IN. We are excited to meet with current customers as well as partners that we have established previous relationships with over the years. We also look forward to meeting many new faces. Rotary Airlock Feeders - If there is one thing that an asphalt plant has, it’s dust. Within the processing equipment there is normally some type of dust collection/filtration system. At the bottom of those dust collection systems there is often a rotary valve, and that’s where we come in! Our legendary rotary valves have withstood the most abrasive materials and are up for the daily grind in an asphalt plant. Cold Patch Bagging - A slightly more specialized piece of machinery has been the development of our Model IAPO (Inclined Auger Packer Open-mouth) cold patch bagging machine. Not only can we provide an easy, accurate, and repeatable offering for bagging cold patch, but we can also provide a complete packaging line with end of line automation like robotic palletizing! World of Asphalt is paving the way to the future and Magnum Systems provides solutions to keep your line moving. Stop by our booth to learn more about how we can provide a solution for your plant’s needs.